Linsey Murdock was kind enough to show off the legendary weapons on tonight's livestream! I'm sure we'll be seeing tons of looks centered on these items in the coming months, but I wanted to take a minute to talk about one of the looks she showed: a necromancer with the new legendary staff Nevermore. Overuse of Black Dye: The problem with using a lot of black dye is that it tends to hide the details of the armor pieces. Often, black can be stronger in a look if it is used as an accent. In this look, I would have liked to see black only on the feathers of the collar. For the rest of the outfit, a base in a deep red or brown could have brought out the wood tones on the staff while still maintaining a dark necromancer feel. Two-Color Looks: In many cases, it is better to use three colors than two. In this case specifically, there's a lovely green on the runes of the staff itself that could be a great accent alongside the spirit-colored teal. It doesn't take much, but something like the gloves being green would have really highlighted this awesome detail! Uneven Dye Colors: This happens all the time: you find a wonderful dye, put it on all your armor, and then see the same dye has suddenly become 7 different colors because of the materials your armor is made from. 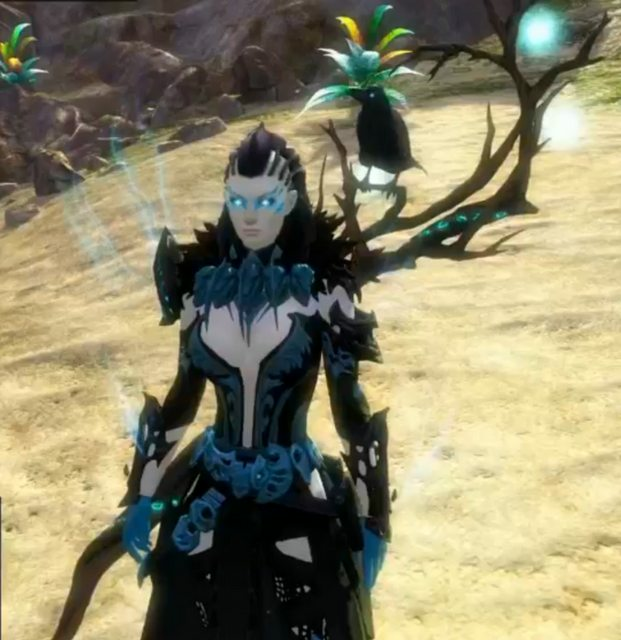 In this case, the necromancer's top is dulling out the color of the dye, while the gloves and pants show a very bright version of it. These cases require a bit of experimentation, but there are often combinations of dye that can be used to give a consistent color across materials. Critiques aside, it was wonderful to see the new legendaries in action! How will you wear them? They may take months to earn, but it is never to early to start planning fabulous clothes to match!